« Ty are having a Peek-a-Boo giveaway contest! New York Yankees limited edition giveaway this weekend! This weekend, there will be a beanie giveaway at the New York Yankees stadium! 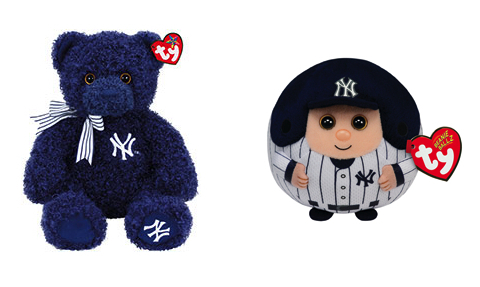 On Saturday 26th September, the first 10,000 guests who are 14 years old and younger will receive a limited edition New York Yankees Beanie Ballz. On Sunday 27th September, the first 10,000 guests of the same age range will receive a limited edition New York Yankees navy blue bear Beanie Buddy. Are you planning on going to watch any of the matches against White Sox this weekend? For more information on the scheduled promotions, take a look at the New York Yankees website.